Our Route 66 Self Drive Motorcycle Tour is a 15 day journey riding along the world famous “Mother Road” highway. You begin your tour in Chicago, IL and ride for 2400 exciting miles to Los Angeles, CA. Along the way you will pass through 8 states: Illinois, Missouri, Oklahoma, Texas, New Mexico, Arizona, and California, making stops in some of the most beautiful and historic American cities. You will get a definite sense of the 1950’s Midwest as you ride your Harley into the Ozark Mountains, along the Old West’s Indian country in Oklahoma, across the Great Plains, through the 400 year old city Santa Fe, NM, and into Nevada gambling Mecca, Laughlin. By the time you make it back to Los Angeles you will have toured the best of the “Mainstream of America”, Route 66! You are free to select a departure date of your choice. Today we head towards St. Louis! We will stay primarily on the 2-lane sections of the Mother Road, traversing cornfields and small towns that represent the heartland of America. Our arrival into St. Louis will be over the Chain of Rocks Bridge, the original bridge where RT 66 crossed the Mississippi River. Enjoy the short ride today into the “Gateway to the West,” St. Louis. This amazing city rests along the shores of the mighty Mississippi River and is home to some of the best live music and BBQ ribs in the country. This morning you should rise early for your journey into the Panhandle, the southernmost portion of the Great Plains, often called “the real Texas”. It certainly fulfills the fantasy of what Texas should look like. Once the buffalo – and the natives – had been driven away from what was seen as perilous and uninhabitable frontier country, the Panhandle began to yield great natural resources in the 1870’s. Helium, oil as well as agriculture, brought wealth to the region and is home to some of the world’s largest ranches. Amarillo may seem cut off from the rest of Texas, but it stands on one of the great American cross-country routes – I-40 (once legendary Route 66), roughly 300 miles from Albuquerque and 250 miles west of Oklahoma City. Amarillo takes its name from Spanish and it means “yellow”, the color that is so characteristic to this region. Why don’t you enjoy dinner tonight at “The Big Texan Steakhouse”. Today you leave Texas and are on your way into “The Land of Enchantment”, New Mexico. Be sure to pass through the world famous Cadillac Ranch before leaving Texas. Stop at the ghost town of Glen Rio, where you can stand with one foot in New Mexico and the other one in Texas. With 4 states behind and 3 still ahead, you ride your bike through the land of Commanche Indians and into Tucumcari, the biggest town between Albuquerque and Amarillo. You head up into the high plains of Santa Fe in central New Mexico. Santa Fe is one of America’s oldest and most beautiful cities, and will be your base for the next two nights. Enjoy our hotel in Santa Fe close to the historic town square and mission. Today is at leisure to rest and enjoy the distinctive flavor of this nearly 400-year-old city. The blend of cultures here becomes evident in the southwestern architectural style so closely associated with New Mexico’s capital city. Perhaps you would like to take a ride along the river valley to the old Native American Indian town of Taos, enjoy a sunrise hot air balloon ride, or play cowboy for a day on a horseback ride along a mountain or canyon trail. This morning you head south, down to Albuquerque, New Mexico’s largest city, home to a third of the state’s population. Albuquerque is sprawling at the heart of New Mexico, where the main east – west road and rail routes cross both the Rio Grande and the old road south to Mexico. You cross the Rio Grande and head west out into the open country and the hues of the Navajo wilderness. Further on ride through Grants and along Cibola National Forest towards the famous Route 66 town of Gallup, an old railroad town and Indian stronghold. Enjoy your stay tonight with a host of fellow riders from around the world at one of the many biker friendly hotels in Gallup. From Gallup it’s only about half an hour to the Arizona border. Once you enter Arizona enjoy a very scenic ride through the Petrified Forest, a fossilized prehistoric forest of giant trees that has been unearthed by erosion. Just west of Petrified National Forest you get to Holbrook and Winslow, two old Route 66 towns that are kept alive by transcontinental truckers. Tonight we will stay in Flagstaff, the northern Arizona community on historic Route 66 and is the regions hub for visits to the Grand Canyon. Today you will be able to visit one of the Natural Wonders of the World, the Grand Canyon. The Grand Canyon comprises of layered rocks, cliffs, hills, and valleys and is among the earth’s greatest on-going geological spectacles. Today you will have plenty of time to ride along the rim and stop for amazing vistas and photos. Tonight you will overnight in Williams where you can walk, dine and shop in this historic downtown on Route 66. Cruise down “Memory Lane” and head towards the town of Seligman, one of the longest surviving stretches of the “Mother Road”. From Seligman, Route 66 heads off on a northern loop through the Hualapai Indian Reservation and a dozens of quickly fading towns. From Seligman you stay on Route 66 all the way into Kingman. Leaving Kingman, stay on Route 66 via the Oatman Highway. Continue on Route 66 / Oatman Highway as you wind through the canyons surrounded by active and extinct gold mines. The town of Oatman is considered a living Ghost Town. Much of the village stays true to its heritage with staged gunfights and wild burros wandering the streets. Continue to the magical oasis in the dessert, Laughlin. 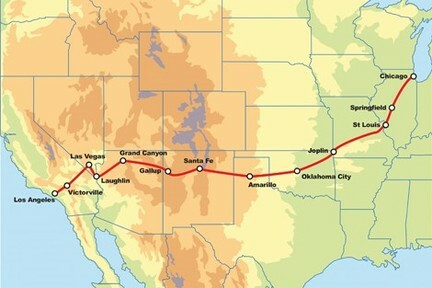 Today it’s off to California, the final state on your ride down legendary Route 66. Ride along the Mojave Desert, which offers some of the most dramatic scenery in Southern California…rolling with lush grasses, startling volcanic formations, large stands of Joshua trees, and even in some Pinyon pines. From the desert you get right into the cool pines of the San Gabriel Mountains. Head for Victorville, which is your base for tonight. Today you are on your way to the final destination of your legendary American road trip, Los Angeles. You head for the end of Route 66 at the Santa Monica Pier. Santa Monica is one of the oldest and largest LA’s resorts. Once a wild beachfront playground, it is now a self-consciously liberal and healthy community. Spend the afternoon sightseeing and enjoy Hollywood with the famous Chinese Theatre, Beverly Hills, Rodeo Drive, and much more. Riders always have mixed emotions as they stand at the “End of the Trail” sign on the Santa Monica Pier. There is a sense of joy and elation at having completed a journey most people only dream about, and a sense of sadness at the thought of the ride having come to an end. The great news is that next ride is just a dream away, and we look forward to welcoming you back very soon. Today your exciting trip will conclude in Los Angeles. Please be sure to let us know if you need an extra night or two in L.A. to enjoy the sights.